I’ve already mentioned I don’t like molding, well that goes for painting it too. To do a good job you have to take your time, and be very careful, something I’m not very good at. There also is a suprisingly large amount of it, particularly in a room with a plethora of doorways. I don’t generaly like taping for a few reasons. Firstly it takes a while to do, making an already slow job take even longer. Secondly you can make things worse if the tape peels up the paint when you take it off. Lastly I’ve never felt it worked aprticualrly well, the paint always seems to seap underneath the tape, no matter how well you stick it down. Well FrogTape claims to at least fix the last one. The Frog Tape has some of that gel stuff that’s used in diapers in it, which the makers claim prevents the paint from seaping underneath it. It’s expensive stuff, but I figured I’d give it a shot and I must say, it does work significanlty better than 3M’s blue tape. It’s not perfect though, I still had one spot where it seaped through. I don’t like doing molding. First its very fiddly work, you have to measure, run downstairs and cut it, bring it back check your fit, trim it a bit, and then do it again. Secondly its the final step in a long process which means that there is nothing later to hide your faults. Basically when I’m doing framing if I make a little mistake I’m like no worries drywall will cover that up. Then when I make a mistake with the drywall I’m like no worries, thats what spackle is for. 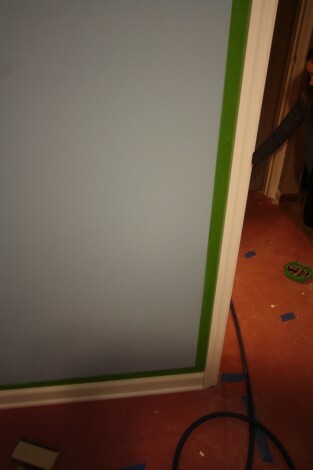 After spackle you have paint. But after molding there is nothing, if somethings out of whack, thats it your screwed. And something is always out of whack. 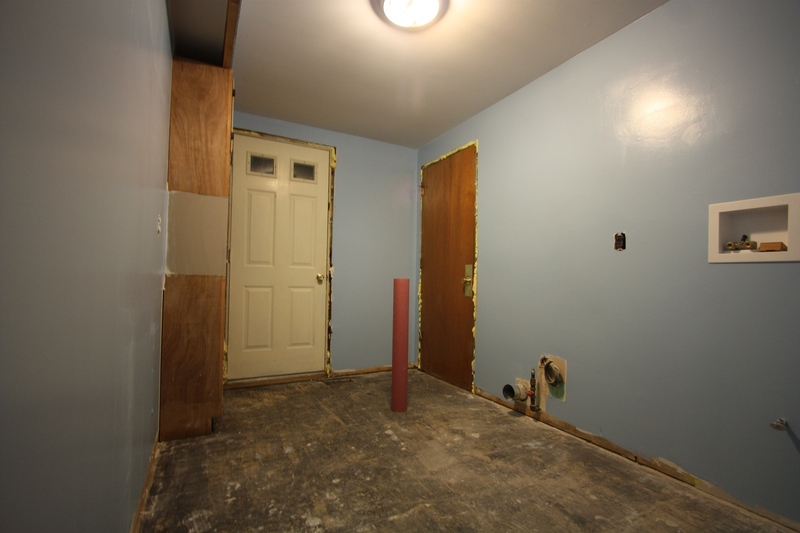 For instance here the door to the jam on the door to the outside isn’t flush with the drywall, so there is a big gap there. The good news though is that with the molding in the room is starting to look done (particularly with this pre-primed stuff). Ohh and I got Jess to do some of the molding too, so that was awesome. No more ugly faux tiles! 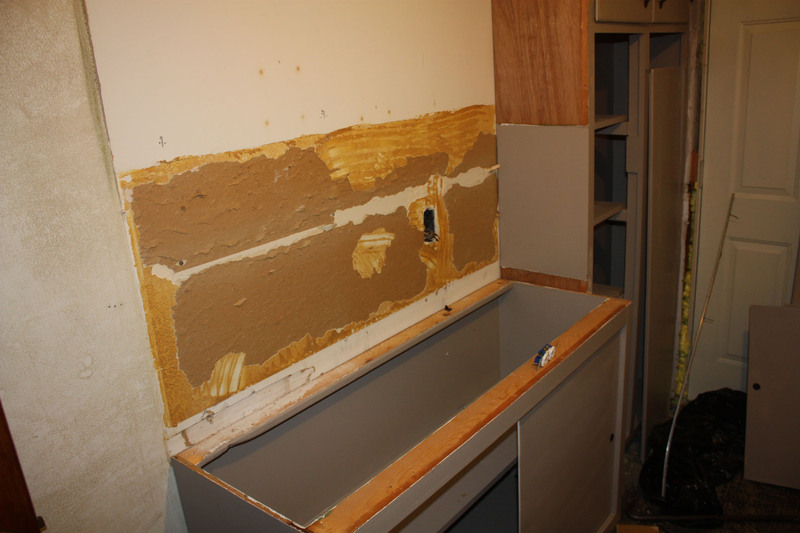 This was the most stressful, and by far the easiest part of the whole remodel. Stressful because of the possibility that I ruined an expensive piece of floor with a bad cut. I was also worried about slipping it under the door jams and molding. 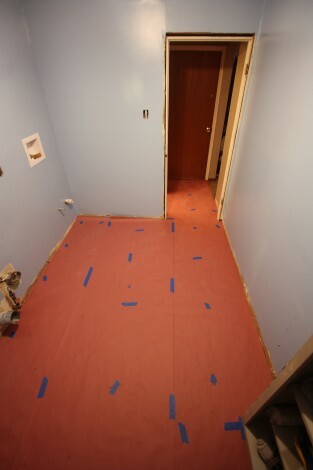 You see, to look good the flooring needs to go underneath everything, but just barely not touching it. The Tarkett Fiber Floor was very flexible though, and was very easy to just bend and slip it under. 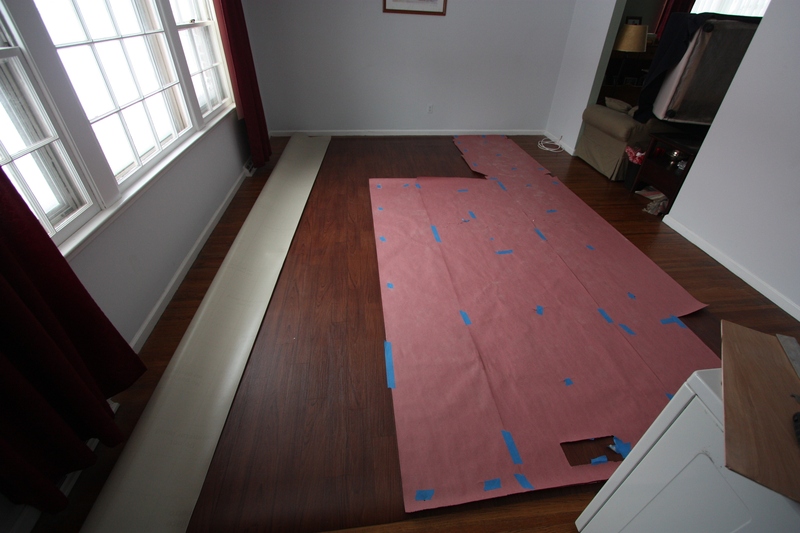 Tarkett also recommends the easiest installation method possible, a glueless one. You just lay the floor down, and you’re done, no glue to mess with. The baseboard will keep the edges from being peeled up, and the flooring is supposed to just lie flat. I was a bit skeptical but figured that if it didn’t work well it’d be easy enough to just pull it up and glue it back down. It seems to have turned out well though, and it looks great! With the template all made up and inspected by my lovely wife it was time to cut it out. I had been planning on doing this in the driveway or in the garage, but with a foot of snow on the ground, and 20 degree temperatures, that didn’t sound like such a good idea. So instead we cleaned out the living room, and did it there. Cutting the template out was actually a bit difficult. A regular utility knife with a sharp blade still tended to tear the paper, and was instantly dulled by the cement floor. I was therefore a little worried about cutting the flooring, particularly in the living room with its nice hard wood floors. However I remembered that I had a few of the hook blades left from when i was cutting up the carpet in the family room. These blades worked incredibly well, and I would highly recommend them to anyone cutting flooring like this. I paid careful attention to my cuts as although you can glue it back together, I really didn’t want to make any mistakes on our $600 piece of vinyl. 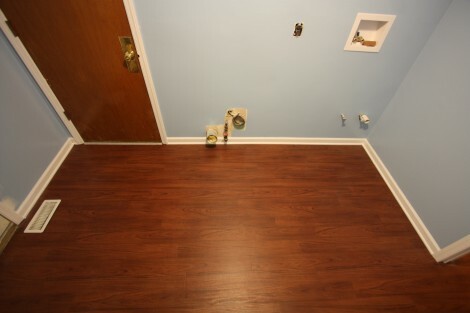 Speaking of which, I should mention that this is not actually vinyl flooring, its technically called resilient flooring. Its made by Tarkett and is their FiberFloor product. Its got a bunch of layers, a nice cushioned high density foam on the back, a fiberglass layer in the middle, with the pattern printed on it, and then a thick urethane layer on top that is textured to match the pattern. We liked it because of its cushion layer, as it feels great underfoot. We wanted a wood floor in the laundry room, however a vinyl floor in the laundry room makes the most sense for us. Its nice and easy on the feet, is very durable, and is waterproof. With a wood floor, we’d be constantly worrying about getting water on it, or scratching it or whatnot. We went to Lowes to look at the flooring choices there, and found a very nice wood pattern that looked great. Things went downhill from there though. The sign said that they would install it for $1.90 per sqft. Seemed pretty cheap, and as it turns out it was. We made an appointment to have someone come out and measure, which cost $35, but would be applied to the cost of the install. Unfortunately once we got the quote back, we realized the advertised price was basicly a bait and switch. not only would the basic install be almost twice that price, but despite the excellent condition of the bare cement floor, they wanted to emboss it for another few hundred bucks. Instead of that we went to talk to Rob over at Carpet Dimensions. We got the carpet for our family room from them, and they were fantastic. The same was also true this time around. Rob mentioned that it was pretty easy to do yourself using some paper as a template. 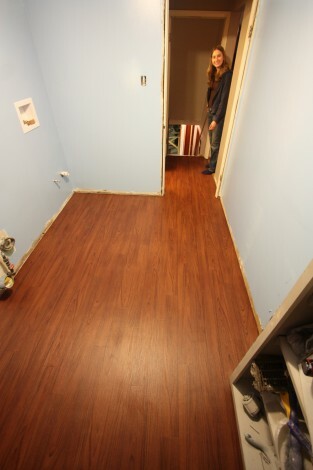 We ordered the flooring, and I got to work making the template. Pretty easy to do, just roughly cut the paper to size, lay it down, tape it to the floor so it doesn’t move around, and then trim it to size. 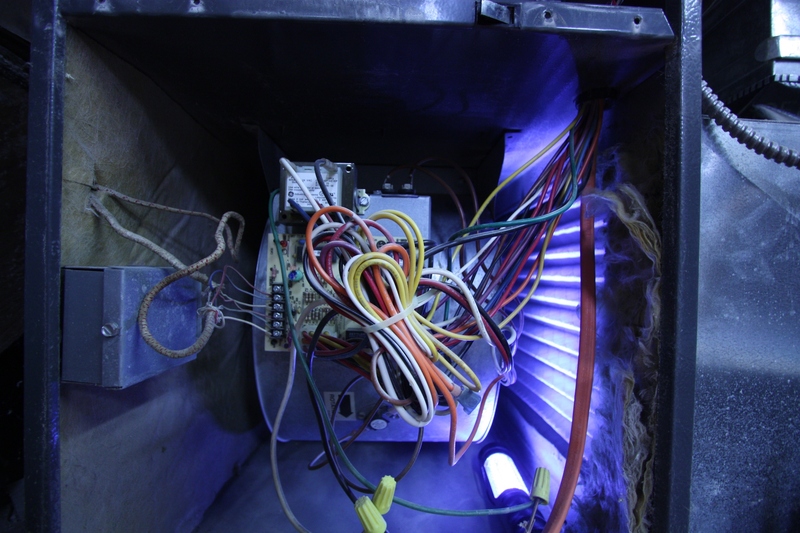 With all the woodworking and spackeling I’ve been doing lately, I was worried that the furnace was getting covered in dust. It only takes a thin layer of dust to wreck the thermal efficiency of the heat exchanger. I do have a filter in there of course, but It doesn’t seal particularly well, so I was though it might be a good time to give it a cleaning. It’s easy enough to take apart, although remembering where all of the wires went would have made putting it back together easier. The fan was pretty dirty, but surprisingly the heat exchanger was clean as a whistle. I keep flip-flopping between paper and fiberglass mesh tape, this time I went with the fiberglass. It’s a bit easier to put on, as you can do it without any mud, but you need to cut it with a knife as opposed to the paper stuff which is easily torn by hand. In addition, the mesh is more difficult to put in corners, nor does it work as well there. 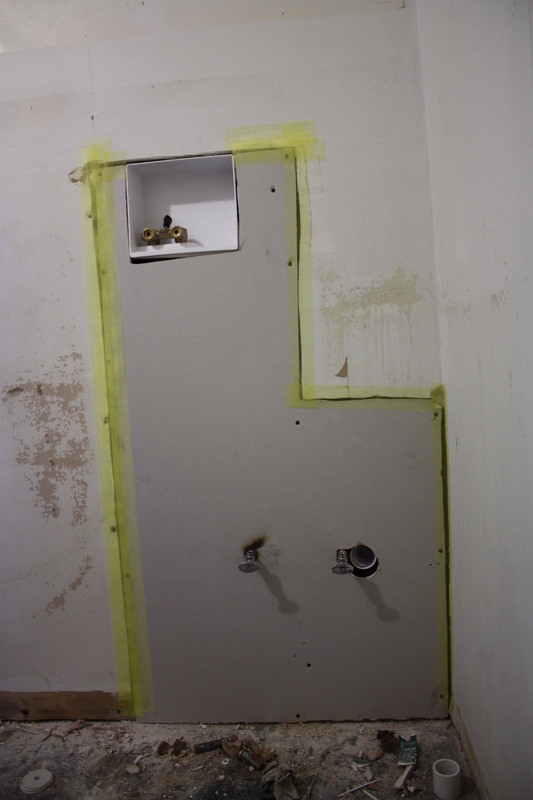 The walls in general were in quite bad shape, so in addition to the patch over the pluming, I needed to pull off a 4’x4′ section that was extremely bowed, and had to do a lot more skim coating and sanding. I typically use the USG Dust Control joint compound, that comes pre-mixed in a large bucket. However this time I tried using the setting type joint compound instead. The primary advantage is the faster drying time, but it also shrinks a bit less and goes on smoother. Of course the setting type needs to be mixed, but thats easy enough with a drill mixer. I got the 90 minutes kind (there is a 45 and a 15 minute as well) despite the name its actually supposed to take between 90-130 minutes to cure. Mine actually took more like 5 or 6 hours. I’m not sure what the reason for this was, however it was still alot faster than the pre-mixed kind, and allowed me to finish in a weekend instead of a few weeks. 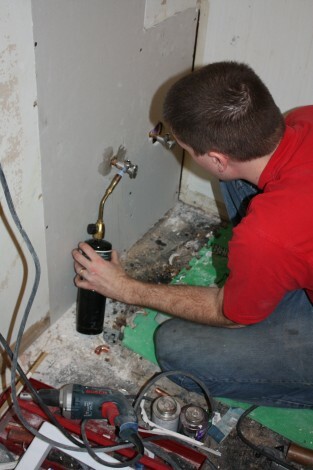 Plumbing is of course key to any laundry room, and the old plumbing in ours needed some work. 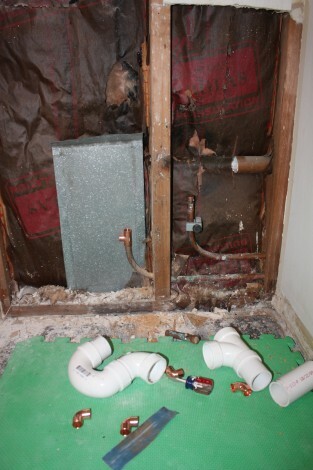 There were two main problems with the plumbing, the first being the lack of shut-off valves on the faucet. 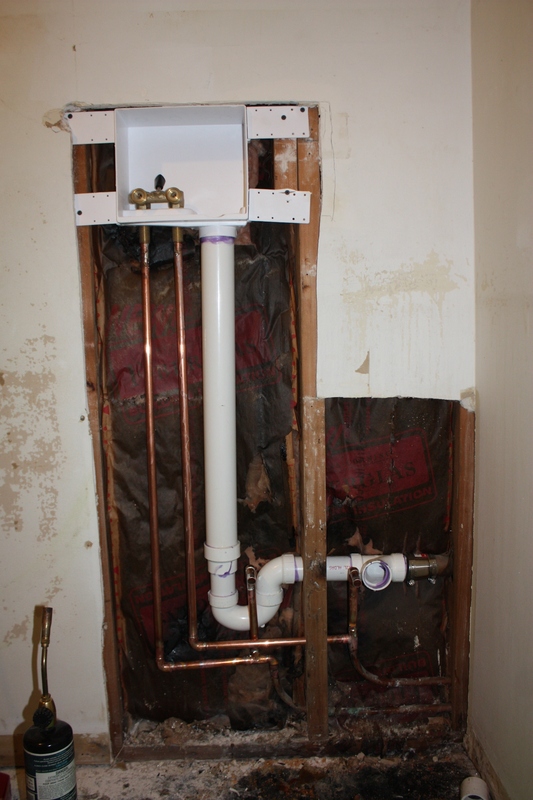 To remove the old sink I needed to turn off the water for the whole house. The valves for the washing machine were of the old screw type, and the hose was impossible to get off of the cold one as well. Those got chucked, and in their place I got a nice dual valve, in a wall recess with a drain. The dual valve is great as it lets you easily turn off the water while you’re on vacation or whatnot, and the drain means that the washing machine won’t drain into the sink now. However with all of this plumbing in the wall things got a bit tight, which made things a bit difficult. 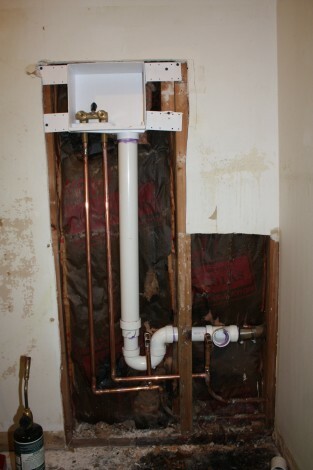 The pipes for the sink get nice new valves, but the valves need to go on the other side of the sheetrock. All of the soldering went well, I used a piece of sheet metal to prevent the torch from igniting the insulation. I did manage to scorch some of the paper, and the studs, but thats about it. I’m not sure what I was expecting, but the backslash removal was a giant pain. I tried to use my pry-bar to pop it up, but didn’t realize that there was construction adhesive gluing the entire back of it to the wall. And then once I got part of it off, I realized it went behind the cabinets. I had to remove the top and bottom cabinent, but was fortunately able to slide it out from behind the big end cabinet. I also managed to take a nice chunk of skin off my knuckles when my hand slammed against the dried (and sharp) adhesive. Good news is that its now out of there, and my blood is mostly cleaned up. 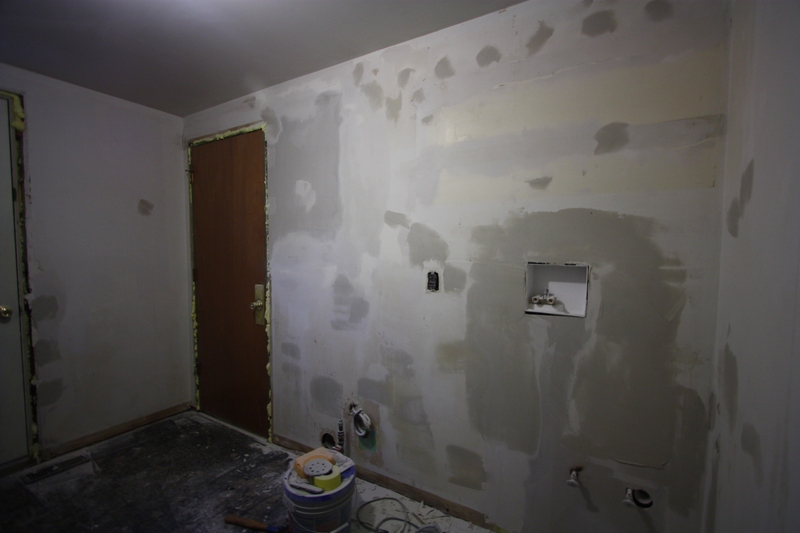 The bad news is I had to tear off a good portion of the wall, and whats left is going to need a heck of a sanding.